The column construction process starts with the hand selection of lumber to be used for columns. We take pride in knowing that we build the best columns on the market by using the best building components and the best construction methods. This leads us to the fist step in the process. Columns are finger jointed together at the point where the white wood meets the treated wood. Using white wood at the upper end of the column provides a big advantage in that it makes the column lighter and easier to install. There are many ways to finger joint lumber together but we feel that we set ourselves ahead of our competition with the method we use. Our method is different than our competition in that we use two separate patterns in our joints. One pattern is used for the treated lumber and a different pattern is used on the white wood. 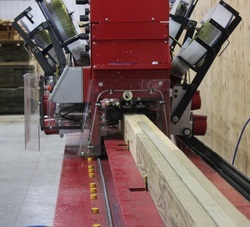 This provides a HUGE ADVANTAGE to us because it allows for us to be selective on how we position the lumber in relation to crown and cups for construction. It all boils down to being able to build a consistently straight column! After the lumber has been finger jointed it is ready for assembly. 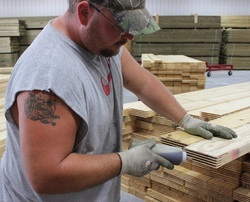 We glue each individual finger joint by hand using a premium liquid polyurethane adhesive. For extra strength we glue each individual ply with a structural adhesive as well. Our columns are pressed together end to end, side to side, and top to bottom. As they are getting pressed together tightly, automated nail guns run down the length of the post shooting a ring shank galvanized nail on 6" centers. After the column has been pressed and nailed together we have a perfectly straight column with both sides and the bottom being square. Since lumber dimensions are often not exactly the same top edge does not always match. This problem is solved easily with our planer. We shave down the top edge so that it is perfectly square which gives the column a professional look. If you wish to put an interior liner in your post frame building, our columns will make it easy! And if you don't, you can be satisfied that you have a great looking column. Our columns are neatly stacked in pre-ordered bundles and tied together with heavy duty nylon strapping. They are now ready for immediate shipment.